Video Systems Integration & Implementation – System Integration is essentially a process of designing an efficient workflow. This involves procuring the necessary equipment, installation, commissioning, configuration & training. It requires Exceptional Planning & Engineering, Critical Systems Knowledge & Extensive Project Management. VidCom provides these services worldwide. We have successfully completed various projects in North America, Asia and Middle East. All of our work is backed by solid post-sales support. VidCom offers Systems Design & Integration for every industry that is involved with professional video, including streaming over internet. This includes Post Production & Broadcast Facilities, House of Worship, Education, Arenas, Stadiums, Research Vessels (Ships) and Live & Mobile Production. 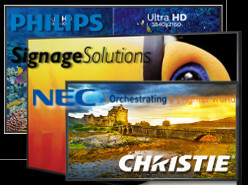 VidCom will conceive, design and execute a design that will meet or exceed all of your requirements. You will have all the competitive advantages that our manufacturers provide in this ever changing world of technology. Our Systems Integration Design involves few steps, from our extensive initial consultation, recommendations, internal and client check-points, full deployment, training and follow-up, and of course, support. Our project management keeps track of everything in simple manageable steps. This is the most important part of the process! We need to find out about you. What your needs & budget are, what your specifications are, what your timelines are, and any other important guidelines that need to be discovered. Once your goals are clearly defined and communicate, your project begins! It’s critical that there are completely open lines of communication so that nothing is missed. Once we have a clear idea of your project, we will draft an Initial Project Document which will define the scope of work, important milestones, action plan and finally the deadline. Once the initial Project Document has been completed, VidCom will create technical and physical design specifications. This includes Technical drawings, patch layout, & rack elevation. With close involvement from you, this will help set the stage for the next step, your facility. Once you have reviewed and approved the Initial Design, VidCom engineers perform a very thorough site-visit to ensure that nothing is missed. We make note of minute details which might be critical in the overall implementation of the project. At this stage we also make recommendations that might improve the overall design of the system or be more cost-effective way of doing things. Once the site visit has been completed, our senior engineers will review the design, specifications & equipment list with you, making 100% sure that nothing has been missed out. We will implement the changes and finalize the Project Document for your approval. Once the final Project Document has been approved, VidCom will proceed with acquiring all the necessary equipment and accessories from different manufacturers worldwide. VidCom has underlying philosophy of using the best of breed products, we typically work with Vendors who offer good products backed by great after sales support. During procurement each and every package is inspected as we receive it in our facility to ensure there was no damage to the equipment during transit. Once all the equipment has arrived, we power up all the equipment individually and test it before mounting it in the rack. After installation in the rack, cabling is done and subsequently systems are updated & configured. We make sure all the bits and pieces are communicating with each other and there is no lag anywhere in the entire chain. Our engineers go through pain-staking process of thorough testing of the equipment to ensure system is optimized and tweaked for maximum performance. One of the last important steps before project can be signed-off is Training. Our engineers and workflow specialists offer you all the training you need, they share their past experiences & challenges and help you get the most out of your investment. We always go above and beyond to ensure you are very comfortable with the equipment you have purchased and in-turn you will be able to deliver an exceptional product to your customers. At this stage essentially both the parties sign-off on the project document, we review all the details of the project and make sure everything has been accomplished to your satisfaction. If there are any outstanding issues we immediately address them. This is one area where we really shine. Time and again we receive compliments from our existing customers about our post-sales support. We have domestic and international customers and we offer them great attention & help. In this age of email and high speed internet access, we can dial into any system in any part of the world, any time zone and see what the issue is. Some of the installs which are of critical nature, we recommend customer stock parts and spares for any emergencies that may arise. That is the VidCom advantage.